There can be significant differences between what is demonstrated during a sales pitch and the suitability of the configurable capabilities of a project management (or PPM/P3M) software tool, in relation to best practice application in the real world. In principle, the many software tools on the market provide similar capabilities, but it is in the detail where there are some variations that make big differences to suitability for real world application. 1. Is it easy to use, reliable and robust? – this is No 1 with good reason – there’s nothing that will kill any chance of adoption more than a software tool that is hard to use or keeps breaking down – it’s well worth checking with other organisations that are already using the tool you are considering before committing to it. 2. Can it be configured to match your organisation’s project, programme and portfolio management (P3M) framework? – a software tool will only be successfully adopted if it can be configured to match a framework that is realistic and suited to your organisation’s culture, environment and P3M maturity. 3. Can it be configured to accommodate defined variations in project and programme management processes and templates? 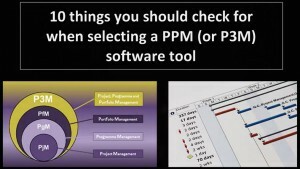 – it is important that your P3M framework has flexibility built into it, for different types, sizes and complexity of projects and programmes, and that the software tool has functionality that can be configured to help you to apply it. 4. Is it easy to configure and administer? – it should be realistically possible for your organisation to maintain and evolve the toolset (including views and reports) as you continuously improve. 5. Is it optimised for single data entry across plans and logs? – the software tool should be fully integrated across plans and logs, so that common fields are pre-populated, to maximise efficiency and minimise poor data quality due to human error. 6. Does it support easy data flow with the Finance function? – it should be easy to create either manual or plan-driven, time-phased, forecast cost data that can be exported to the corporate finance system. Similarly, it should be easy to import (at least total, if not time-phased) actual cost data from the corporate finance system. Or, alternatively, it should be easily possible to bring the actual and forecast cost data together within a reporting application. Either way, it should also be easily possible to maintain common alignment, of the cost categories within the PPM (or P3M) tool with those of the corporate finance system. 7. Does it provide good visibility of resource demand versus capacity? – it should be easy to view aggregated, time-phased, demand versus capacity, data of individual resources and groups of resources across projects, based on generic roles and named resources. It should also enable easy application and control of your process for assigning named resources to projects, and be easy to maintain a condition whereby resources are not over-allocated across projects. 8. Does it enable you to model your portfolio of projects and programmes to help you to prioritise and select them? – it should enable you to prioritise your projects and programmes based on total benefits and costs, alongside strategic alignment, whilst being able to model and select the options based on time-phased budgets and resource capacities. 9. Does it enable you to create ‘what-if’ scenarios? – it should be possible to make major changes to multiple plans, without affecting the original plans until a preferred overall scenario is achieved. At this point, the new scenario should be easily invoked. If, however, a preferred scenario is not achieved, then it should be possible to retain the original scenario. In order to decide whether a revised scenario is preferred, it should provide good visibility of the effects on time-phased cost and resource demand data. 10. Is it possible to view audit trails? – When an organisation has a lot of projects in-flight in parallel, which are sharing resources, it is important to be able to understand which projects caused any over-allocations. It can also be important to check the audit trail to understand when and how any unusual changes have been made to plans, especially if multiple users have access rights to edit plans. I hope that you find these tips useful as a checklist to use as part of your requirement specifications and during vendor demonstrations. Do you know how good your organisation is at delivering projects? Do you have a Splat the Rat approach to resolving operational issues? Does the successful delivery of your organisation’s projects depend on your suppliers?